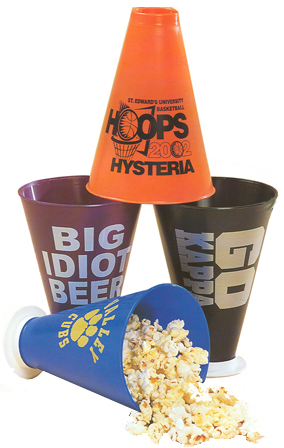 These Plastic Megaphones can be custom-imprinted with any design/message you choose. Each Custom Megaphone measures 7.5" x 2" x 5.25". Black, green, orange, purple, red, royal blue, white, and yellow Plastic Megaphones are available. You can choose from a one-sided, wrapped, or two-sided imprint. Optional white end caps are also available to transform the Custom Imprinted Megaphones into cups that can hold popcorn, chicken fingers, French fries, and many other snacks. We also offer clear lids that cover the large end of the Megaphones to help keep food warm and securely in place. Our Custom Plastic Megaphones are great for sporting events, colleges and schools, promotions, bars, football specials, and much more. The minimum order is 100 pieces, and you can mix colors in quantities of 25 Megaphones per color. Production time is about 5-10 days. It's easy to get started with our Custom Plastic Megaphones – simply call 1-800-233-0828, and then e-mail your camera-ready artwork to graphics@kardwell.com (you can also mail your design). The minimum order is just 100 Plastic Megaphones. Production/shipping time is 5-10 days. Rush delivery is available for an additional charge.